Voters this fall will once again be asked to decide a state constitutional amendment that seeks to define a person to give legal rights to an unborn child. In March, Colorado Amendment 62, called the Personhood Amendment, was placed on the ballot after the Secretary of State certified nearly 100,000 signatures in support. Backers say the ultimate goal is to overturn Roe v. Wade. A similar measure was defeated in 2008, 73 to 27 percent. Unswayed, proponents are not only back but have tweaked the language to make the language broader. A person is no longer defined from moment of fertilization. Now a person is given rights at the beginning of biological development. Backers say this change offers protection for the unborn during such things as in vitro fertilization. It also could potentially prohibit birth control methods that prevent implantation in the uterus. Working tirelessly in support and in opposition of this controversial amendment are two accomplished, articulate women. Both are veterans in the political arena; both are passionate and unwavering in their beliefs. And both have devoted decades trying to defeat what the other stands for. Leslie Hanks. Watkins. Vice President of Colorado Right to Life. 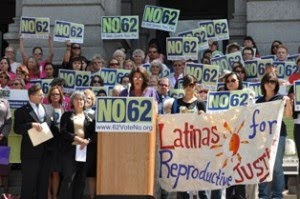 Co-sponsor of Personhood Amendment 62. The first toe-dip into politics for Leslie Hanks came in 1986 when she was asked to run for PTA president at her kids’ school in the Bennet 29 School District. She was a stay-at-home mom who was going to college to earn a degree in English. She agreed to run not knowing of the fight that soon would change the course of her life. Growing up in the Chicago suburbs, she says she was completely apolitical. Her father was a jazz musician, her mother a traditional housewife who sometimes felt restless in the domestic world. “My parents were both highly opinionated so I come by it naturally,” jokes the 59-year-old mother of two and grandmother of eight. She has been married to the same man 39 years. She is at once cheerful and relaxed, without a hint of the contentiousness that often swirls around her chosen causes.